Get this date on your calendar now! Check back for more 2019 information. The bicycle tour that has made a tradition of great rest stops and super rider support will return for 2019. This is one event you don’t want to miss! There is a tour for everyone. 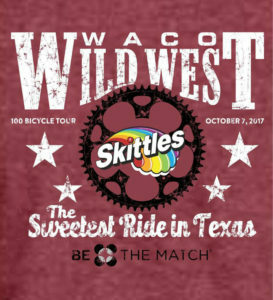 They don’t call us the Sweetest Ride in Texas for nothing…Fill your helmet with Skittles and other candy at the finish line! Groups of 10 or more contact us for a discount code. Register EARLY to Guarantee you get a T-Shirt. Late Registration T-Shirts will be first come first serve. 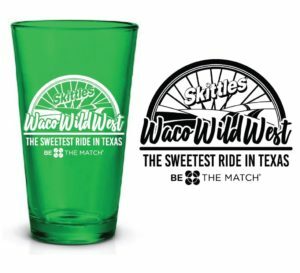 The first 500 registrants receive our commemorative pilsner glass that, like Skittles, are in the colors of the rainbow! Check out our 2018 jersey. Pre-order with your registration. Only jerseys ordered by September 7, 2018 will be guaranteed to have in hand by ride day. We will order extras but if you want to get your jersey for the ride, order by the deadline. Can’t be there on October 20th? Or don’t want to ride the distance all at once? Do it on your own time and your own schedule and still earn your finisher medal! Proceeds from this ride benefit the Be The Match Registry® and various other local organizations. The bicycle tour will take place rain or shine. Create your fundraising team, set a goal, and fill out the race entry form. Share your fundraising link via social media, email, etc. After you meet the minimum goal or after your card has been charged for the entry due to an unmet goal, your entry will be activated. ONLY YOU, as fundraiser team leader, get a free entry if the goal is met. Your fundraising team members will NOT receive free entries. Some races have optional selections with extra costs beyond your free entry. The checkout price is the amount you will be charged if you don’t raise the minimum. Register to ride for free. Click the green Fundraise button. 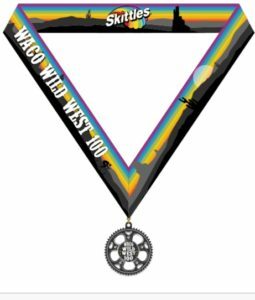 The Waco Wild West Bicycle Tour has made a tradition of great rest stops and super rider support will return for 2019. This is one event you don’t want to miss! There is a tour for everyone.